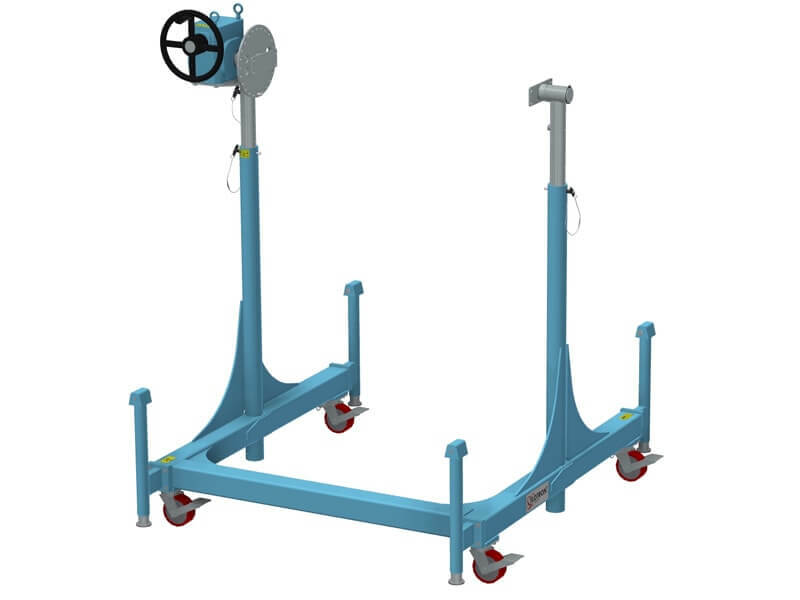 Rotation fixture with 2,600 lbs. capacity and 47" frame width capable of swinging a 58" diameter payload. Couplings allow for up to 1 degree of angular misalignment per side. Double reduction gearbox helps to prevent stair stepping of eccentric payload CG. 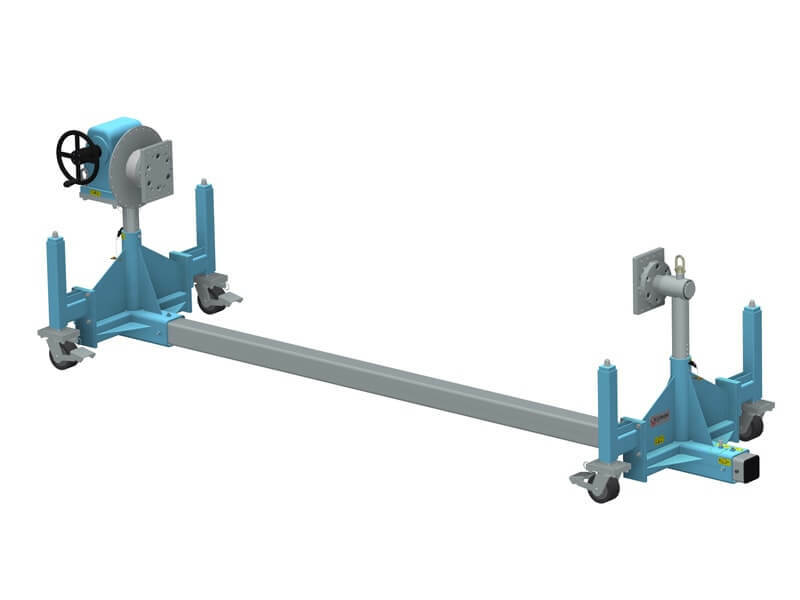 Rotation fixture with 2,200 lbs. capacity and 71" frame width with drop center main beam capable of swinging an 86" diameter payload. Couplings allow for up to 1 degree of angular misalignment per side. Double reduction gearbox helps to prevent stair stepping of eccentric payload CG. 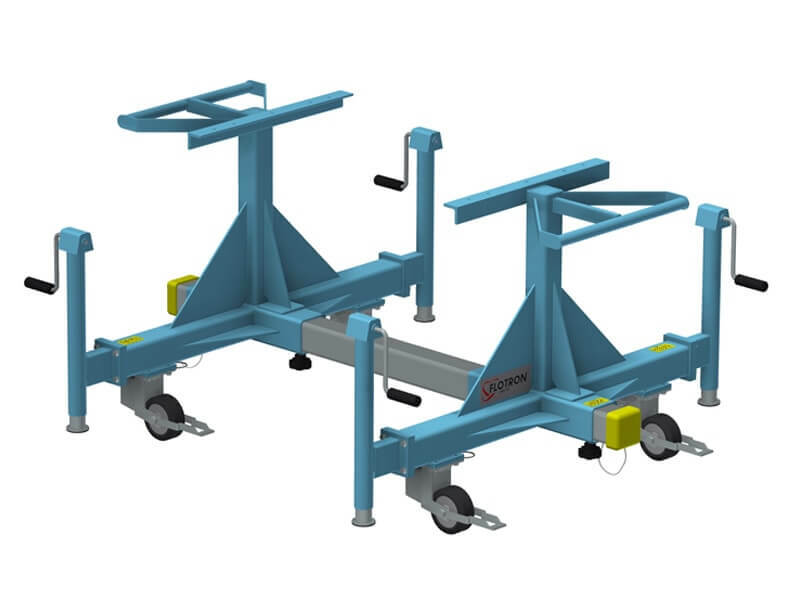 Caster jacks provide ground clearance when needed. 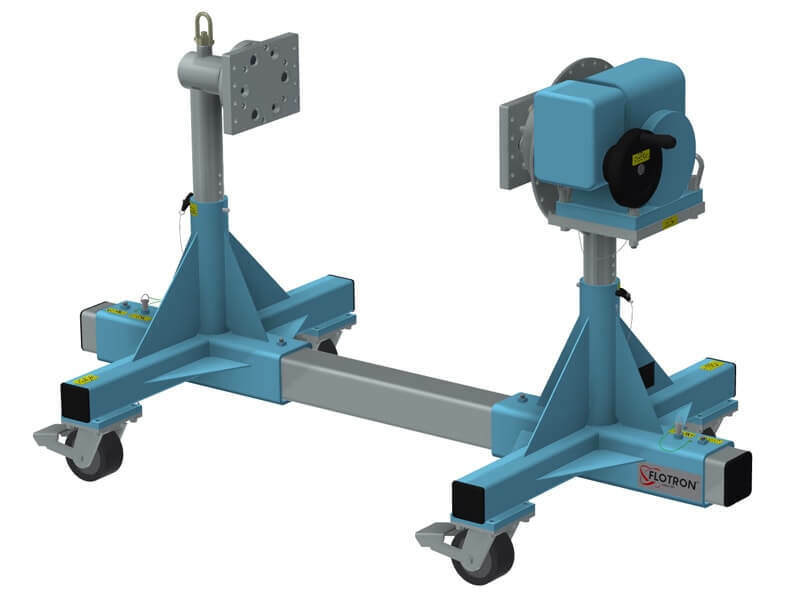 Rotation fixture with 2,400 lbs. capacity and 54" frame width with drop center main beam capable of swinging a 62" diameter payload. Couplings allow for up to 1 degree of angular misalignment per side. Single reduction gearbox minimizes backlash. 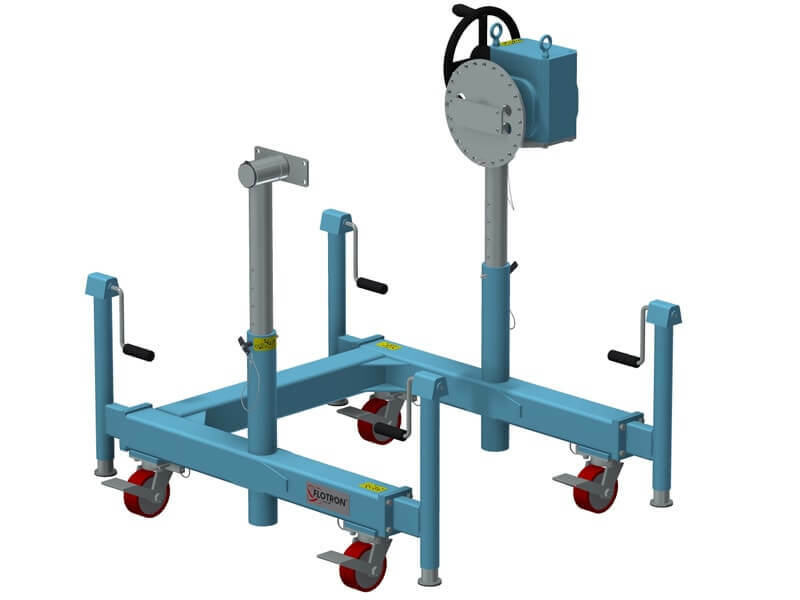 Caster jacks provide ground clearance when needed. Rotation fixture with 1,100 lbs. capacity and 71" frame width with drop center main beam capable of swinging a 94" diameter payload. Couplings allow for up to 1 degree of angular misalignment per side. Single reduction gearbox minimizes backlash. Leveling jacks level the Flotron and payload on uneven flooring. Asymmetric frames consider eccentric payload CG during a transportation load case when coordinating tight hallways. 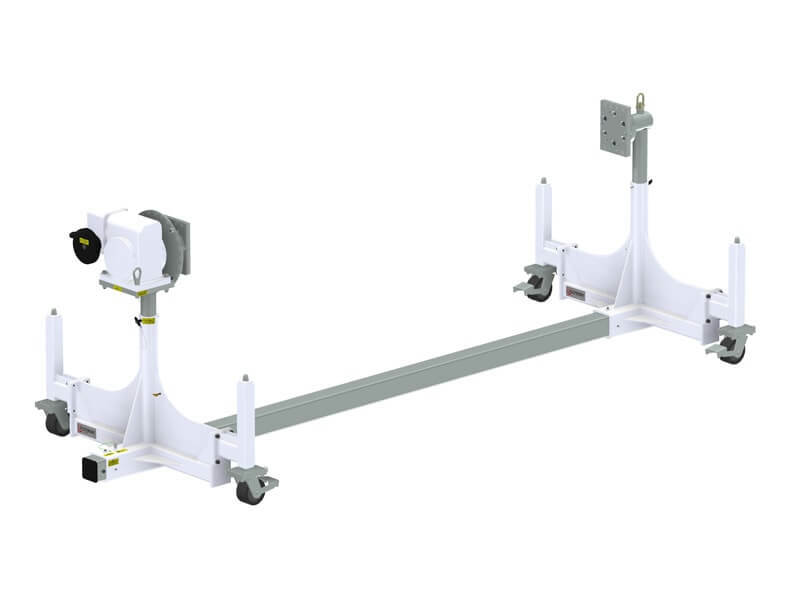 Rotation fixture with c-shaped frame that provides access for a cart to roll underneath rotation axis. 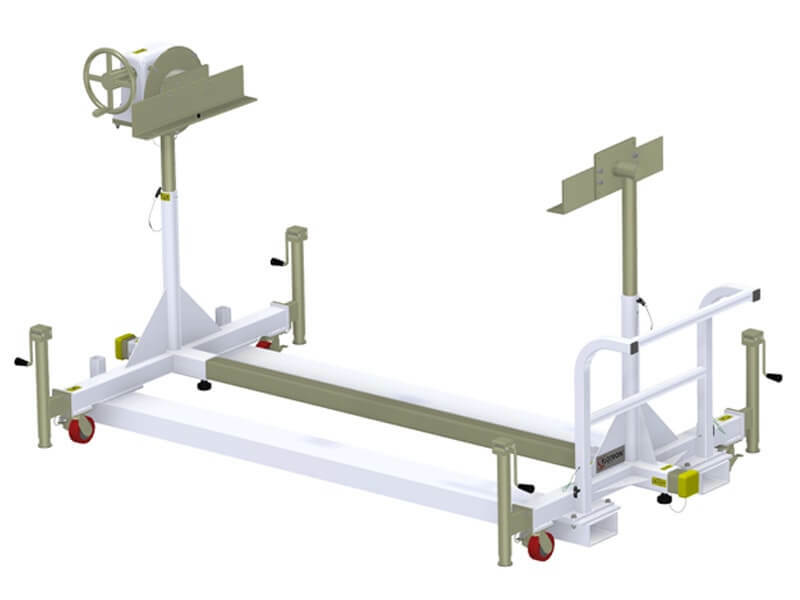 Synchronized hydraulic lift and rotation fixture with c-shaped frame that provides ergonomic access and maximizes swing clearance. 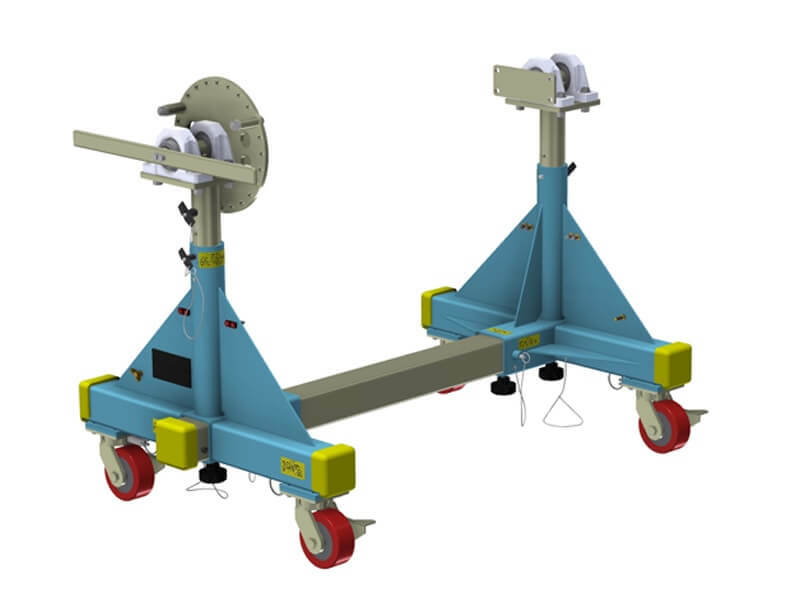 Rotation fixture with c-shaped frame and large swing radius capable of rotating a tall payload during assembly operations. 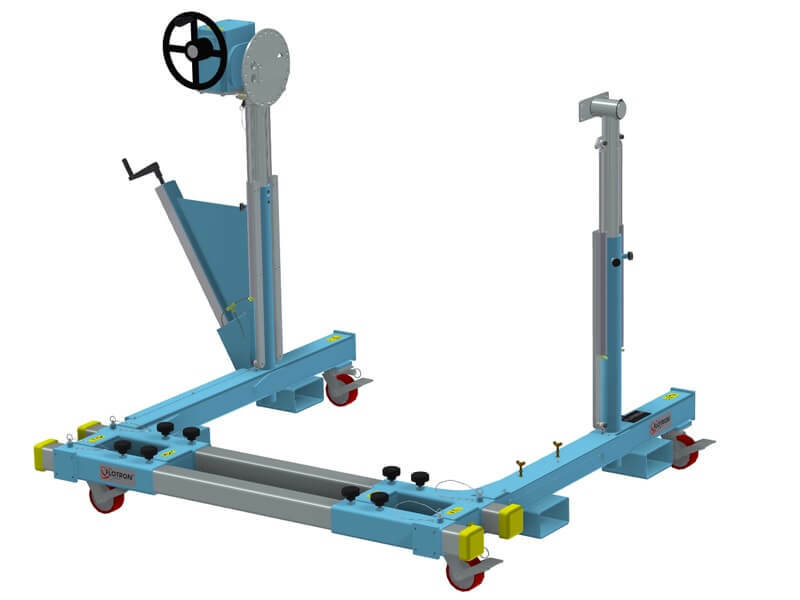 Synchronized hydraulic lift and rotation fixture with c-shaped frame that provides ergonomic access and maximizes swing clearance, includes forklift tube pockets. 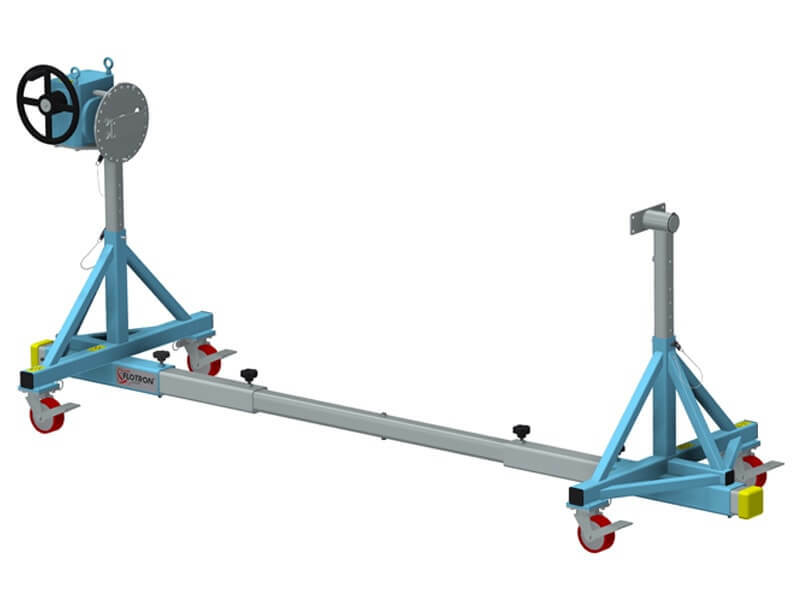 Mobile platform with leveling jacks and lifting features. Rotation fixture compatible in clean room spacecraft manufacturing environment. Includes a low-backlash gearbox with zero-backlash hub, a push bar, removable forklift tubes, leveling jacks and special interfaces. 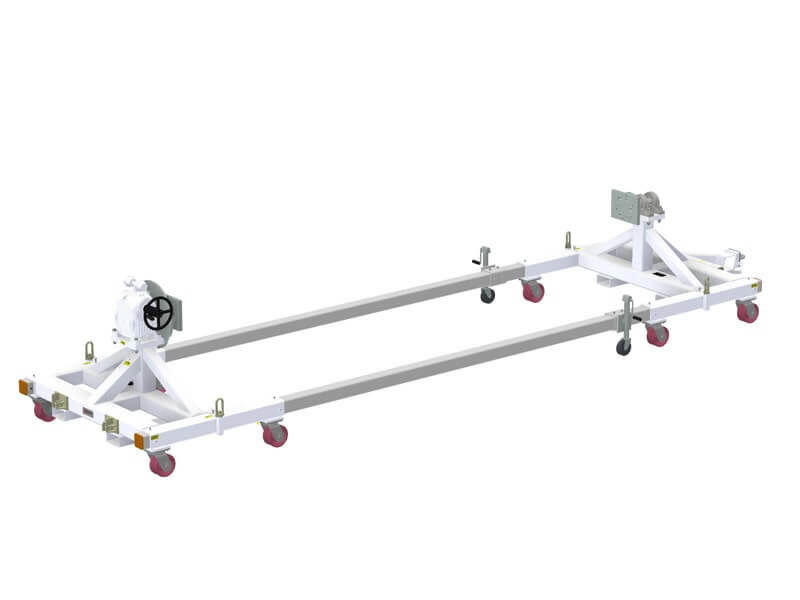 Composite mandrel fixture compatible in curing oven, v-groove casters track inverted angles into oven, low-backlash gearbox with zero-backlash hub, and tow bar. 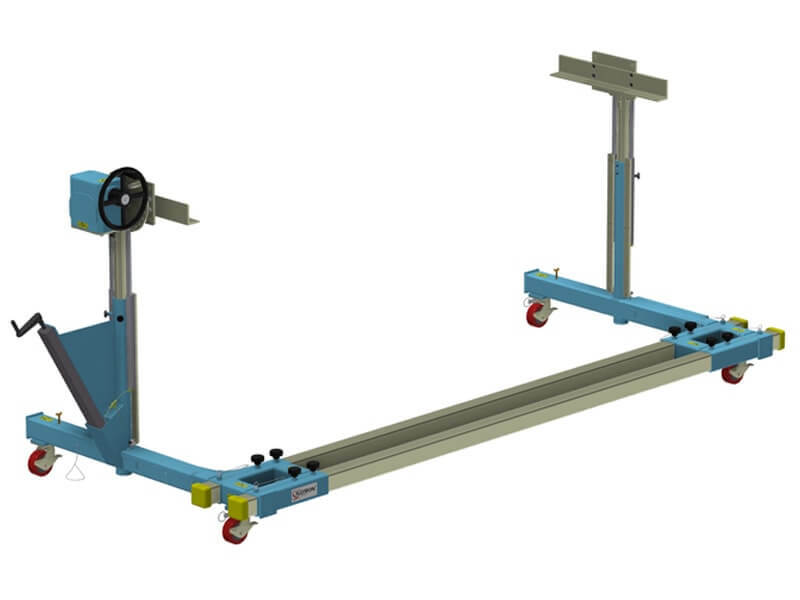 Small footprint rotation fixture with ballasted end frames, dual pillow block risers, rotation handle and indexing plate for payloads with minimal CG eccentricity and ESD safe features. 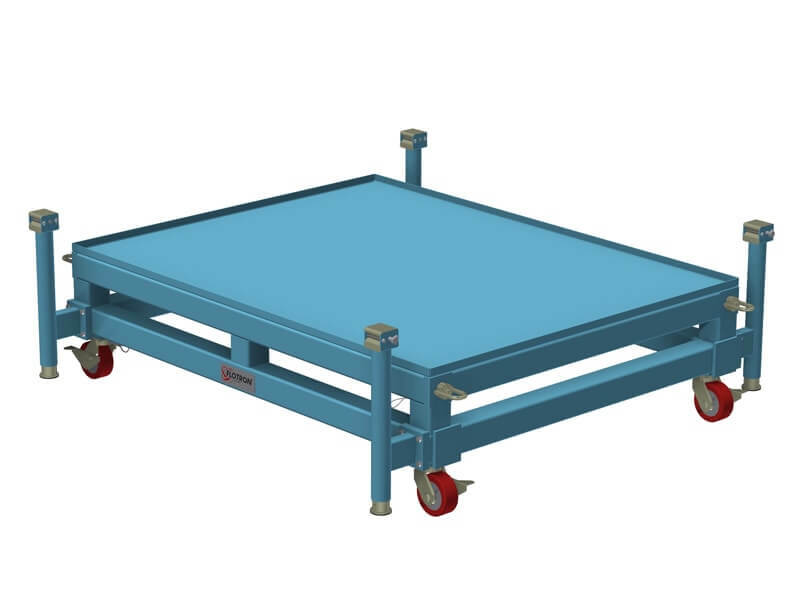 Transportation fixture with push bars, spring loaded casters, special interfaces and leveling jacks to level on uneven flooring. 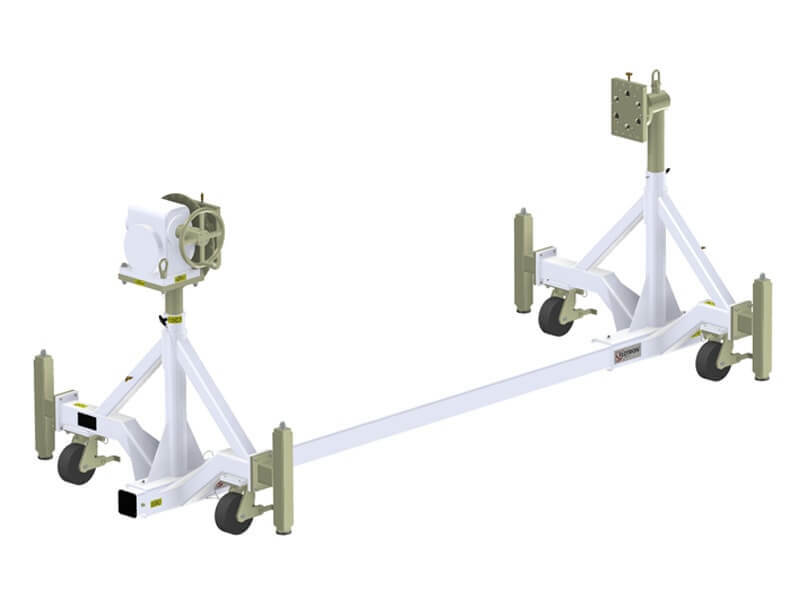 Rotation fixture with telescopic main beam that allows for interface distance adjustment to accommodate various payload lengths without the risk of a trip hazard caused by a protruding main beam.